Mount Jefferson is a prominent feature of the landscape seen from highways east and west of the Cascades. Mount Jefferson (one of thirteen major volcanic centers in the Cascade Range) has erupted repeatedly for hundreds of thousands of years, with its last eruptive episode during the last major glaciation which culminated about 15,000 years ago. Geologic evidence shows that Mount Jefferson is capable of large explosive eruptions. The largest such eruption occurred between 35,000 and 100,000 years ago, and caused ash to fall as far away as the present-day town of Arco in southeast Idaho. Although there has not been an eruption at Mount Jefferson for some time, experience at explosive volcanoes elsewhere suggests that Mount Jefferson cannot be regarded as extinct. If Mount Jefferson erupts again, areas close to the eruptive vent will be severely affected, and even areas tens of kilometers (tens of miles) downstream along river valleys or hundreds of kilometers (hundreds of miles) downwind may be at risk. Numerous small volcanoes occupy the area between Mount Jefferson and Mount Hood to the north, and between Mount Jefferson and the Three Sisters region to the south. These small volcanoes tend not to pose the far-reaching hazards associated with Mount Jefferson, but are nonetheless locally important. A concern at Mount Jefferson, but not at the smaller volcanoes, is the possibility that small to- moderate sized landslides could occur even during periods of no volcanic activity. Such landslides may transform as they move into lahars (watery flows of rock, mud, and debris) that can inundate areas far downstream. The population at immediate risk in the Mount Jefferson region is small, but these residents as well as other people who visit the area for recreation and work purposes should be aware of the potential hazards. Probably the greatest concern in the Mount Jefferson region is the possibility that large lahars might enter reservoirs on either side of the volcano, namely, Detroit Lake to the west and Lake Billy Chinook to the east. Lahars entering these lakes could set up large waves that could overtop dams and possibly cause dam failure, with catastrophic effects downstream. Such events have very low probabilities but great potential consequences. 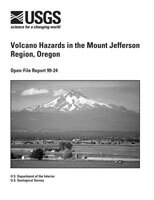 This report describes the kinds of hazardous geologic events that have occurred in the Mount Jefferson area in the past and shows, in the accompanying volcano-hazards-zonation maps, which areas will likely be at risk when hazardous events occur again in the future.